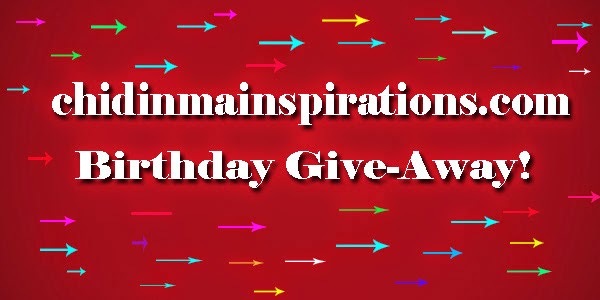 Chidinma Inspirations: chidinmainspirations.com Birthday Giveaway! This blog was birthed on the 25th of March 2014 and published her first post this >>> chidinmainspirations.com/2014/03/welcome-to-chidinma-inspirations-blog.html?spref=tw … on the 26th of March 2014. It has indeed been a journey. I am so overwhelmed with joy and gratitude to God Almighty for seeing me through this journey. It hasn't been a smooth one but it has indeed been a life changing and an awesome journey. Furthermore, we all make this blog. I might be the owner of the blog but the truth is, we all are the owners of this blog. I so much love it when you send me emails and say ''our blog''. To clock this blog's birthday, there is going to be a give-away to 5 lucky winners. The winners will be announced on the 25th of March and the prizes will be given on the 26th of March by the grace of God. The third prize is N1500 airtime and it will be given to the first person who says correctly the date our BOOK REVIEW forum officially kicked off. The fourth prize is N1000 airtime and it will be given to the first who says correctly the date our In House Round Table Talk forum officially kicked off. Please Note: All answers should be published on this POST in the comment section. When commenting, please include your email address and the network of your choice. Happy bornday to chidinma inspirations.com.many more years ahead.my day is never complete without visiting the blog.More blessings to the ceo of our blog. You are the number one fan of Chindinma inspiration's blog no doubt about that, going by your consistency in comments. Missed you and your lovely comments..
ghen ghen! no be small journey o! to have been blogging consistently for a year!!! wow! that is amazing! believe me,it is not an easy task...WELL DONE AUNTY CHIDINMA! Thumbs up to you! this *our* blog is indeed going to greater heights! yayy! happy birthday to our GREAT BLOG...long live CIB!! AMEN!! Wow. Amazing is the word. Happy One year in the biosphere Chi mo. It will only get bigger and better. Shout out to all the faithful readers of this amazing blog. The first In-House Round Table Talk officially kicked off; Tuesday, 16 December 2014 with the topic "Should A Girl Keep Her Virginity Before Marriage Or Not?" PS: Adeboye wasn't right. She didn't mention the month. Chi, unfortunately, no Friday Inspirations for the Month of March 2015 yet. March has no Friday yet. But, if you are taking about "the first inspiration for this month", the writer is you, because no other name was mentions there. The book review forum officially kicked off "Saturday, 17 January 2015"
Hmmm, happy birthday to chidinma Inspirations blog. Hmm, coming back later with the answers. Missed everyone like .... Hope you guys have been good. Thanks Chi for your mail, I really appreciate it. Happy Anniversary once again. P.S: had little issue with my google account. Will be back shortly after work. 1) The date this blog was changed from chidinmainspirations.blogspot.com to chidinmainspirations.com was 9th October 2014, but officially announced on Friday October 10th 2014. The Princess By Lori Wick which happens to be one of your best novel (winks) as revealed in the review. 3) In House Round Table Talk forum officially kicked off on Tuesday 16th December 2014 with Should A Girl Keep Her Virginity Before Marriage Or Not?